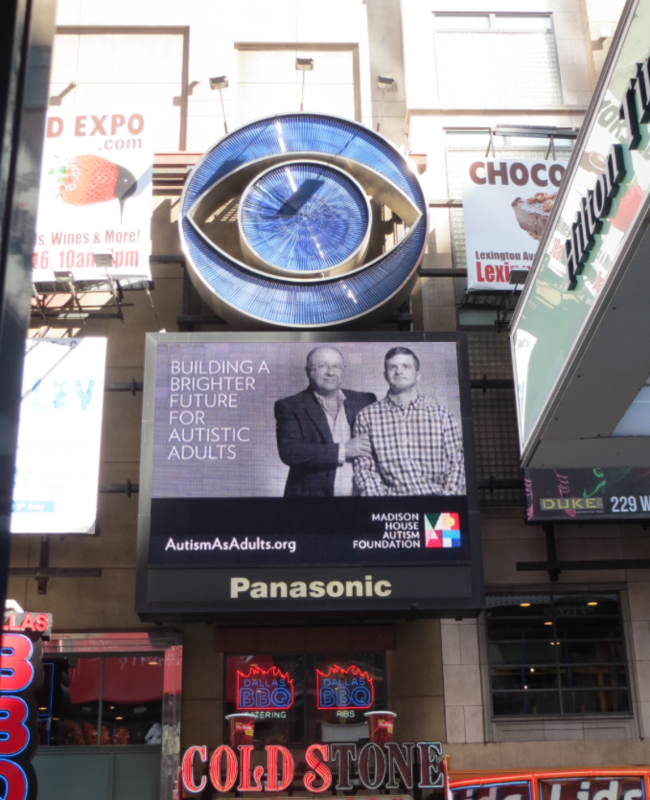 Madison House Autism Foundation celebrates the potential of adults with autism and the extraordinary contributions of their parents with a Times Square billboard campaign during April, Autism Awareness Month, 2013. See the billboard below. Case Studio, an internationally recognized rebranding firm, designed the campaign with photography by Douglas Sonders. “Madison House Autism Foundation focuses on families like ours that worry and stress about our childrens’s future. We are grateful to contribute our services to be part of this solution and hope others will lend their support to lead the way forward for families and adults with autism. The campaign drew attention to loving parents and their adult children with autism who face a very uncertain, and often isolated future. Parents across the country face the daily nightmare of not knowing what will happen to their child when they are gone. They are asking, Where will my child live? How will he or she be cared for? Who will pay? Madison House Autism Foundation is one of the first and few organizations focusing solely on efforts to improve the quality of life for autistic adults. Introduced by Madison House Autism Foundation, the Coalition for Community Choice (CCC) strives to address the growing national need for affordable housing and meaningful work for individuals with disabilities by increasing the quality and supply of choices in a broad range of housing, community, and employment opportunities specifically individuals with intellectual/developmental disabilities (I/DD). Over 100 organizations are currently part of the CCC network. Supports and life opportunities for individuals with disabilities should be person-centered and based on their individually defined preferred settings, support needs, and meaningful life goals. Quality of support services should be based on the feedback, culture, and personal experiences from individuals being supported, and their families and caregivers, rather than specific physical characteristics of a setting. Individuals with disabilities have the human and civil right to choose from the broadest range of home, workplace, and community supports and settings. Policy should increase options and decrease barriers to affordable housing, meaningful work opportunities, and direct support service professionals. The development of home, community, and work opportunities should be driven by the individuals who are and will be receiving support services in those settings. For several years, Madison House Autism Foundation has been actively engaged with the Interagency Autism Coordinating Committee (IACC) at the National Institutes of Health. IACC serves as the the federal advisory committee that coordinates all efforts within the Department of Health and Human Services (HHS) concerning autism spectrum disorders. MHAF President, JaLynn Prince, is honored to be asked and will serve on an IACC working group to discuss various aspects of Question 6: What does the future hold, particularly for adults? JaLynn Prince’s most recent IACC speech stressed the urgency of services for adults on the autism spectrum in areas of housing, healthcare, education, and employment. She also highlighted the need for more formal research and better policies. Her speech is transcribed here or watch the video (begins at 3:14:30). We are grateful for the work that IACC is doing to move the dial forward on adult issues impacting the autism community. Help us take a stand for adults with autism. They need our support, not only in our local communities, but across the nation.